Gary, the guy sitting in the red chair, is from Memphis and was scheduled to have both knees replaced on December 19. Last summer, he and a coworker (Greg) joined a cistern-building mission team that consisted mostly of folks from another church. Neither Gary nor Greg had been to Xpujil before, nor had anyone else from their church. A couple months later, Gary sent me an email. He touted an affordable, easy to use, long-lasting water filter that attaches easily to a bucket. The Sawyer PointONE filter pores are so small (0.1 micron absolute) that no bacteria, protozoa, or cysts like E.Coli, Cholera, and Typhoid can get through. It has been used for years throughout the world in places with living conditions similar to the Xpujil region. To hammer home the filter’s effectiveness, Gary sent me a video. In it, he poured pond water into a bucket equipped with the filter, and then drank the water that flowed from it. Back in 2017, another American partner gave me a Sawyer PointOne filter attached to a bucket. I researched it, decided that it would be a good tool for our cistern partners, but then did nothing. When the Sawyer PointONE filter suddenly reemerged in Gary’s video, I got the feeling that now is the right time for our Mexican partners to have the opportunity to try it. Gary ordered seventy-five filters and made them fit into one suitcase. I did the same. Gary joined us for our annual Cistern Loan Repayment Meetings scheduled for early December. Gary and I bought the filters, but the funding came from those Mexican cistern partners who made cistern loan repayments. They didn’t know it yet, but they were about to make it much easier for themselves to purify their cistern rainwater. 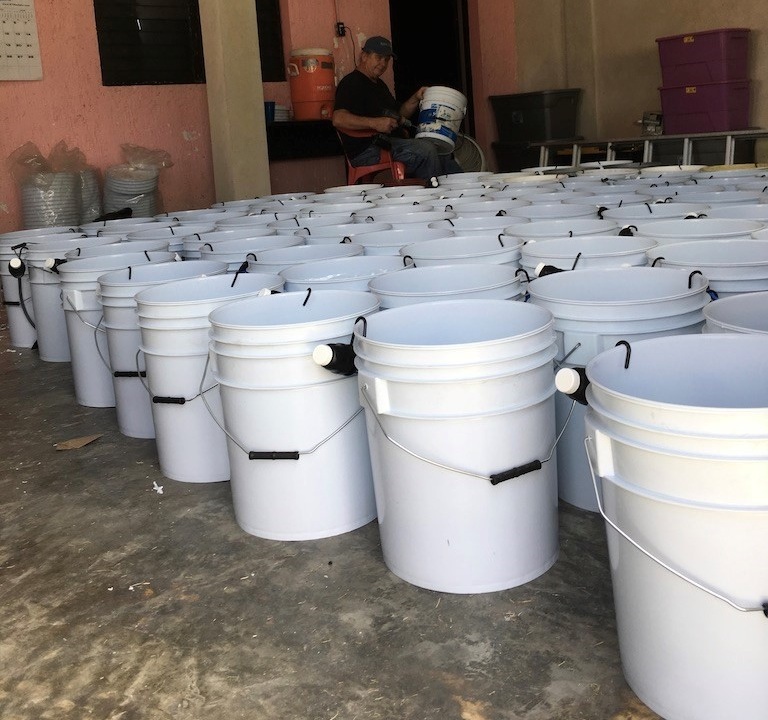 A couple weeks before our arrival, I sent an odd text to our partner in Xpujil, “Felipe, please buy 150 five-gallon buckets.” The bucket money came from cistern loan repayments. 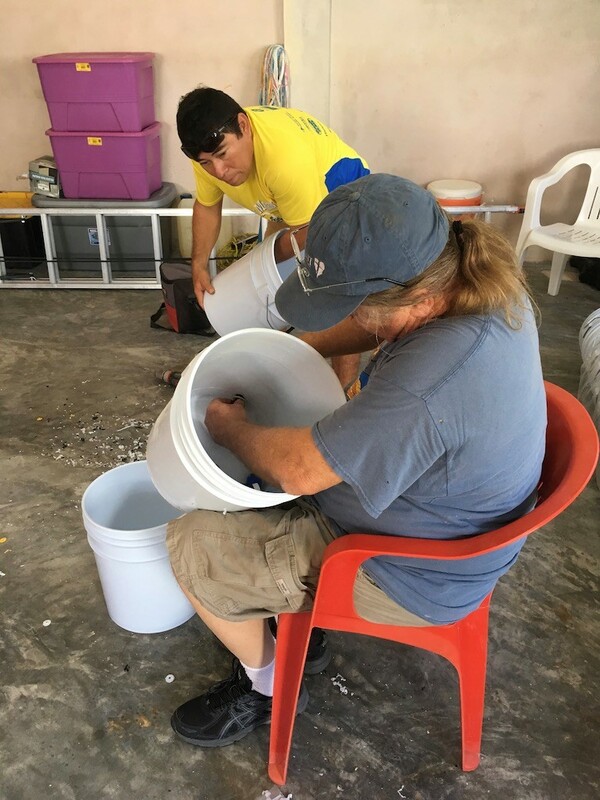 Gary and Felipe spent a couple of mornings and afternoons attaching the filters to the buckets. Yes, their fingers got sore. For one week, Gary, Felipe, and I met up with Victor and spent our evenings meeting with our cistern partners, processing loan repayments, and distributing filters. When our Mexican partners saw the filters, a few partners went home to get money to make a repayment – just to make sure they would get one. Gary and I helped distribute about 135 filters. Fourteen more were distributed by Felipe and Victor during a meeting in Once de Mayo after we left. Only one filter could not be distributed because the assembly kit was missing an important piece. There are well over one hundred cistern family-owner partners who are also eligible to receive a water filter, but our supply ran out. This water filter story is just beginning. I will travel back and forth between Xpujil and Chicago a few times during the next few months with more filters in my bag. We hope to distribute them to our cistern partners that have graciously decided to make repayments over the years. Please pray that our Mexican partners will properly maintain their water filters so that they will provide the four million liters of clean drinking water that they are designed to deliver. In closing, I’d like to share a few nagging questions that weigh on me even when our work is going well and making a difference in others’ lives. Should there be more partnerships where the materially poor and weak have opportunities to help themselves? Do we serve in ways that suggest that those in need truly have nothing to offer? How can we sharpen our discernment about our own brokenness and others’ dignity as we strive to answer the call to love our neighbors, especially the downtrodden? It seems to me that these are important things to wrestle with as we serve others in Jesus’ name. Read more about the Luke’s ministry HERE. The Outreach Foundation is seeking $4,200 per month for support funds for Todd Luke and $2,000 for the cost of one cistern.